Huge changes have occurred on Gili Trawangan in the last few months when the government took back the beach and ordered the clearance of all buildings and structures on the sandy side of Trawangan’s main path. The government informed all the businesses to take structures, tables and sunbeds on the beach. Although they are still clearing the rubble and foundations, our beaches are now reverting back to their natural state. You can actually see the sea from the main street and the beach isn’t littered with little jewellery stands and restaurants. A true tropical paradise is reviving! This has made a massive change for the turtles around the island that found their way back to make their nest on the beach. In a weeks’ time, three hawksbill turtles laid their eggs on the beach on the east side. Turtles need clean, dark and peaceful beaches to dig their nests and now Gili T is starting to be the perfect example of this! Turtle eggs need a long time to incubate and hatch. When they hatch, they will rush back to the ocean and out to deep sea find their way back to the ocean – if all the conditions are good. What means: no light, rubbish, holes or castles in the sand or anything else that can confuse the hatchlings, or get in their way of getting to the sea. It’s a great accomplishment for Gili Trawangan to house the nests of hawksbill turtles, as they appear on the IUCN list as critically endangered. Around the Gili Islands, the two main turtle species are green and hawksbill turtles. Hawksbill eggs need 60 days of incubation before they hatch. The biggest reason for the hawksbill to be endangered is human activity. Turtle eggs are still seen as a delicacy in Indonesia and if they survive to juvenile or adulthood, they are fished for their flesh or decorative shell, despite being a protected species. 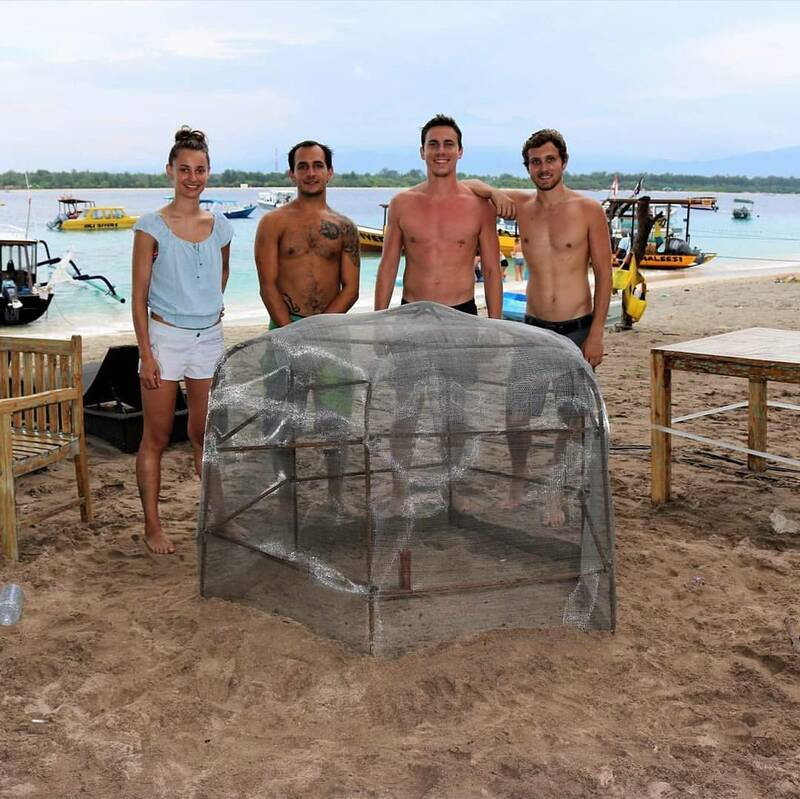 The interns of the Gili Eco Trust took immediate action to protect the nests by building a metal structure that later can be used as a Biorock, they protect the nest from lizards, cats and poachers. This way we also try to raise awareness amongst tourists and locals to keep beaches clean and turtle-safe! Now, staff working in shops close by, tourists and Gili Eco Trust interns check and monitor the nest and hopefully more news in 2 months when the incubation period is over! If you see a turtle attempting to nest on Gili Trawangan then please call 081339600553 or 081339603861 to report it. Turn off ALL torches, video equipment and make sure there is no flash photography. Do not attempt to touch the turtle or get in her way.